@ Kathryn - Castor oil is so healing for so many things. You can read a little story about a gal who used castor oil packs to heal abdominal adhesions on the earth clinic site. I link to it above. The packs have worked wonders for me and they are so safe that I wouldn't be afraid to try it. May take persistant use...read the story. Hope this helped. Thanks for the info! My natruopath recently had me start using castor oil paths over my liver area. It's good to read more on what is going on when I do so. I may have to try it on some muscle strains too! Thanks again! A friend of mine has a bottle of castor oil her naturist doctor gave her. Now I should keep some of it. Thank you for sharing. I didn't know castor oil had so many other uses! 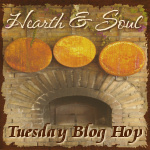 Thanks for sharing this great information on the Living Well Blog Hop. Castor oil packs are amazing and I'm glad you explain how it works. My 17 year old daughter was just diagnosed with an ovarian cyst about the size of a jumbo egg. Her doctor told her that it is normal and to wait 6 weeks and they will take another ultrasound. I went to our local natural practicioner who advised to the use Castro oil pack after applying my dad ghter was in extreme pain she said it felt like something was poking at the cyst and is afraid to do another treatment. Is this pain normal? Wow! I wish I could address this question for you but I am not a health professional so if you have a natural practitioner, who advised you to try the castor oil packs, you could ask them about the pain. I'd be interested to know what they tell you. I've read that sometimes the cysts will break or be absorbed into our bodies but I can't really say what happened with your daughter. I would keep an eye on her temperature and hot spots in the area that may indicate infection...if that happens please consult your doctor or natural practitioner right away. I am a huge fan of natural remedies, as you can see, but sometimes emergency medicine needs to be the allopathic variety which will act quickly. God Bless and keep me posted if you don't mind. Can castor packs be used on the scalp or head? Hi. Thanks for your question. I am not a medical doctor so this is just my humble opinion. I've read that castor oil is great for your hair and scalp so I don't think it would hurt to try it on your scalp. But I would also follow up with your doctor just to make sure of what it is you are trying to treat. Also, USP grade castor oil, without any added essential oils or anything helps me when I have a sinus or eye irritation. For starters this was an amazing post. Sharing it with my husband and starting him on castor oil asap. He's had adhesions from his surgery 18 months ago, drs aren't doing anything... offered to cauterize the nerve or give him addictive drugs :( hoping this works. Why can't a breastfeeding mom use castor packs though? I really want to work out but my body is injured. I'd love to try this on my sciatic and ankles but I'm breastfeeding. Is it one of those we say this so we aren't liable things? Or is there a reason mom's shouldn't do this? Breastfeeding moms should use castor oil packs with caution because of the detox that often happens after use. Abdominal adhesions are the formation of scar tissue between the little and internal organs. In any case, it is very important for you to understand that the patient may first be treated with Herbs for Adhesions to see whether it is fruitful in relieving the blockage and the related side effects, while surgery is utilized as a go down.